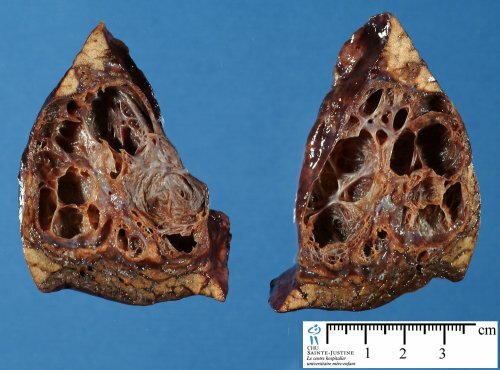 This article introduces pulmonary pathology and discusses an approach to lung specimens. Medical lung disease is dealt with in the medical lung disease article. Tumours of the lung are dealt with in lung tumours article. Lung cytopathology is dealt with in the pulmonary cytopathology article. CT-guided or ultrasound-guided needle core biopsy - for peripheral lesions. Transbronchial biopsy - for central lesions. "Open lung biopsy" - typically a video-assisted thoracic surgery (VATS) - done for diffuse lung diseases. These specimens should be sectioned to create pieces with a large surface area; ideally, it should be one large piece per block, so one can appreciate the architecture. Lobectomy - usually for cancer. Pneumonectomy - usually for cancer. Explantation - in the context of lung transplantation - done for cystic fibrosis Idiopathic pulmonary fibrosis and other causes. Inadequacy rate for percutaneous biopsies ~5% in one series. Length 0.5-1.5 cm enough for EGFR testing. All lung pathology can be grouped into one of six categories (as per Leslie). The radiology directly correlates to the pathologic grouping, except that air space disease encompasses three pathologic categories (ALI, CCI, AFD). 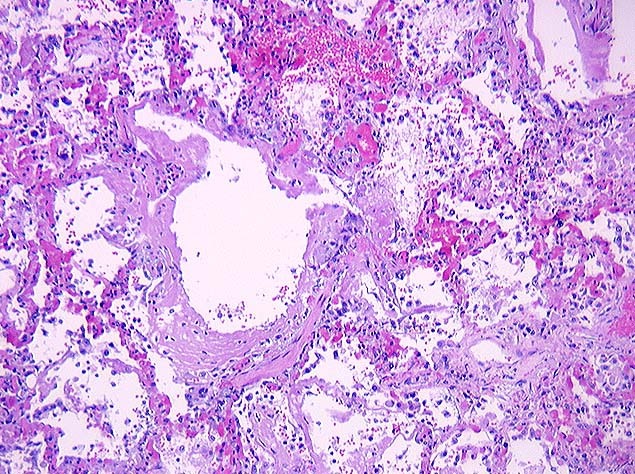 Acute lung injury: hyaline membranes (very pink on H&E). Fibrosis = thick walls - pink on H&E. Chronic cellular infiltrates = inflammation (blue on H&E). Nodules = look at the history/radiology - should say mass or nodule. Alveolar filling defect = crap in the alveoli. Near normal = looks almost normal. Most of the things that come to pathology are in the mass/nodules category and lung tumours (discussed below). The other categories are dealt with in the medical lung disease article. Terminal bronchiole - dilation distal to this = emphysema. Alveolar duct - dilated in ARDS. 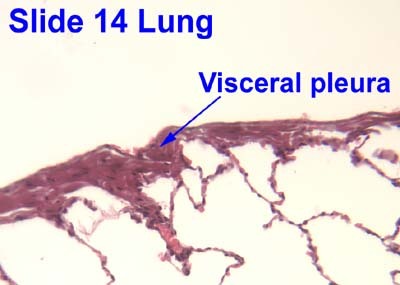 Visceral pleura = covers the lung. Parietal pleura = covers the chest wall. Pleural invasion is an important prognosticator in lung cancer and should be considered if the tumour is close to the pleura. Arterial vessels travels with the bronchus. Venules travel in the septae. Arterial vessels in the lung should be approximately the same size as its accompanying airway. Arteries (which were once thought to contain air) are with the airway. Type I pneumocyte - cover most of the alveolar surface. Type II pneumocyte - stem cell, produce surfactant. Typical location: "angle of alveolus". Small clusters ~ 6 cells ("neuroepithelial bodies"). - SMALL FRAGMENT OF BENIGN BRONCHIAL MUCOSA WITH INFLAMMATION. The clinical history of a mass is noted. - Tiny cluster of indeterminate cells insufficient for a diagnosis, see comment. - NEGATIVE for definite lesion. Deepers were cut (x3). The radiologic findings are noted. A re-biopsy is recommended. - NEGATIVE for granulomatous inflammation. - NEGATIVE for evidence of mass lesion. CK20 negative, CDX2 negative, beta-catenin membranous staining). Siderophages = mononuclear phagocyte with hemosiderin. Hyaline membrane = glassy layering of an alveolus/small airways with material that is eosinophilic on H&E. Entomology of Hyaline: "... of glass" (Greek). Bronchiolization = ciliated (respiratory) epithelium or goblet cells in (distal) air space. Smoker's macrophages = brown-pigmented macrophages - assoc. with smoking. This pretty much always comes to the pathologist. Diffuse lung diseases, e.g. usual interstitial pneumonia. Usually in mediastinum or hilum. Fit into the bigger category of foregut cyst. Cyst lined by respiratory epithelium. Previously known as congenital cystic adenomatoid malformation (CCAM). Type I = mostly large cysts. Type II = mostly small cysts. Type III = solid mass. Irregular cystic spaces with bronchial epithelium. Bronchial epithelium = cilia, pseudostratified. Typically not connected to airway tree/trachea. Blood supply arises from aorta, not the pulmonary artery. Associated with other congenital anomalies. The most common are diaphragmatic abnormalities - including congenital diaphragmatic hernia. Wavy luminal contour/undulating contour (normal ~ round/ovoid). Distal airways with ciliated epithelium. +/-Interstitial fibrosis due to inflammation. Extralobular sequestration - several images (sonoworld.com). Classically identified due to recurrent infections or bronchiectasis. Intralobular sequestration can be considered a variant of ELS; it is like an ELS but surrounded by normal lung. AKA lung infarct, lung infarction, pulmonary infarction. ↑ McSweeney, SE. ; O'Regan, KN. ; Mc Laughlin, PD. ; Crush, L.; Maher, MM. (2012). "Evaluation of the efficacy and safety of percutaneous biopsy of lung.". Open Respir Med J 6: 82-8. doi:10.2174/1874306401206010082. PMID 22977650. ↑ Zhuang, YP. ; Wang, HY. ; Shi, MQ. ; Zhang, J.; Feng, Y. (Dec 2011). "Use of CT-guided fine needle aspiration biopsy in epidermal growth factor receptor mutation analysis in patients with advanced lung cancer.". Acta Radiol 52 (10): 1083-7. doi:10.1258/ar.2011.110150. PMID 22006985. ↑ Hegele. 27 October 2009. ↑ URL: http://www.ouhsc.edu/histology/Glass%20slides/14_15.jpg. Accessed on: 10 October 2012. ↑ Leslie, Kevin O.; Wick, Mark R. (2004). Practical Pulmonary Pathology: A Diagnostic Approach (1st ed.). Churchill Livingstone. pp. 266. ISBN 978-0443066313. ↑ Cutz E, Yeger H, Pan J (2007). "Pulmonary neuroendocrine cell system in pediatric lung disease-recent advances". Pediatr. Dev. Pathol. 10 (6): 419–35. doi:10.2350/07-04-0267.1. PMID 18001162. ↑ Leslie, Kevin O.; Wick, Mark R. (2004). Practical Pulmonary Pathology: A Diagnostic Approach (1st ed.). Churchill Livingstone. pp. 236. ISBN 978-0443066313. ↑ 12.0 12.1 12.2 Mitchell, Richard; Kumar, Vinay; Fausto, Nelson; Abbas, Abul K.; Aster, Jon (2011). Pocket Companion to Robbins & Cotran Pathologic Basis of Disease (8th ed.). Elsevier Saunders. pp. 363. ISBN 978-1416054542. ↑ Chen, C.; Zheng, H. (Jun 2008). "Extralobar pulmonary sequestration in the hilum.". Asian Cardiovasc Thorac Ann 16 (3): 246-8. PMID 18515678. http://asianannals.ctsnetjournals.org/cgi/content/full/16/3/246. ↑ URL: http://radiopaedia.org/articles/congenital-pulmonary-airway-malformation. Accessed on: 10 February 2012. ↑ 15.0 15.1 15.2 Klatt, Edward C. (2006). Robbins and Cotran Atlas of Pathology (1st ed.). Saunders. pp. 100. ISBN 978-1416002741. ↑ URL: http://www.humpath.com/spip.php?article8685&id_document=22510. Accessed on: 8 April 2012. ↑ Rosado-de-Christenson, ML. ; Frazier, AA. ; Stocker, JT. ; Templeton, PA. (Mar 1993). "From the archives of the AFIP. Extralobar sequestration: radiologic-pathologic correlation.". Radiographics 13 (2): 425-41. PMID 8460228. http://radiographics.rsnajnls.org/cgi/pmidlookup?view=long&pmid=8460228. ↑ Chang, LW. (Sep 2011). "[Incidence and risk factors of bronchopulmonary dysplasia in premature infants in 10 hospitals in China].". Zhonghua Er Ke Za Zhi 49 (9): 655-62. PMID 22176899. This page was last modified on 6 January 2017, at 00:01.